Helloooo, April. April Fools has always been one of my favorite holidays. I’m ruthless about it. My childhood pranks consisted of unplugging the fridge and turning the house upside down in the name of ‘Aprils Fools’. My teenage April fools jokes only got more cruel – from telling my mother I was pregnant to calling my father crying about dropping out of school. I was just plain awful. I feel a little unprepared today. I usually have a list of pranks that I spend the day playing on people. But this year I have nothing. No silly string was bought in advance and no text messages were craftily worded out. I wonder if I’m loosing my touch? I think I’m just having a hard time drawing the line between what are acceptable pranks at my age? If I was to trash a house then I’d have to clean it up – sooo… jokes on me (and we all know that’s no fun). Do any of you guys have some really good pranks planned today? Anyhow, so I feel the need to point out that April Fools has nothing to do with this salad. I just wanted to talk about April fools. And now I want to talk about salads (I can do…you know, pick topics…because it’s my blog). So we are going to talk about grain salads. The lettuce has been looking pretty sad at my co-op these past few months so I’ve been turning to grain salads more and more for my lunches. They are portable, easy to make a big batch ahead of time, and super filling. If I could, I would eat wheat berries for every meal. They are wonderfully chewy and filling and stuffed full of fiber. However Wyatt isn’t a big fan so I’ve been hiding them along with other grains. It’s been working out wonderfully! They give a hidden chewiness to the salad that makes you work a little harder and leaves you feeling more satisfied! This salad is on the sweet side because of the maple syrup so I would suggest serving it with a side of almond butter and toast. Or if you want something savorier, swap out the maple syrup and orange juice for balsamic vinegar. Don’t be afraid to play around here! First, prepare the grains. 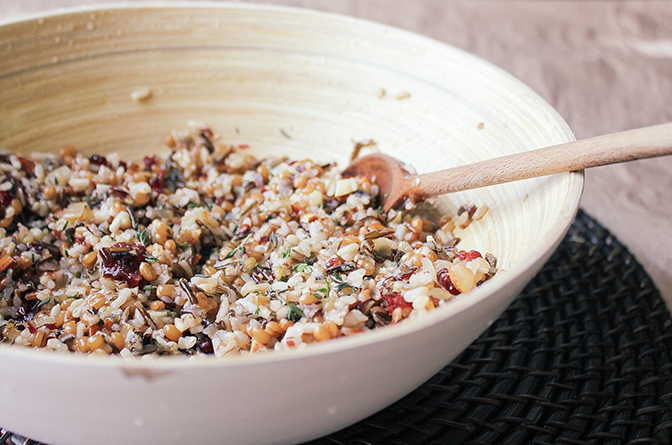 Place the wheatberries in 3 cups of water and let simmer for 45 minutes. Place the wild rice in an pot with 2 1/2 cups of water and bring to a boil. Once the wild rice water is boiling, reduce to a simmer, cover, and let cook for 30 minutes. Drain both the pots (if there is any water leftover after the wild rice has absorbed it) and set aside. In a small saucepan, heat the olive oil over medium. Add the onions and saute for about five minutes (or until softened). Add in the garlic and saute for another minute. Remove from heat. 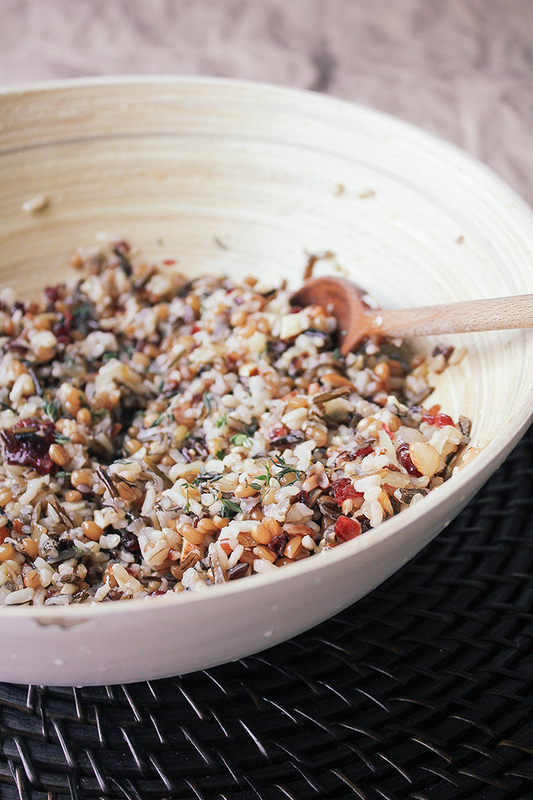 In a large bowl, mix the wild rice, wheat berries, and onion mixture with the rest of the ingredients. Serve right away or stick in the fridge for an hour to help the flavors meld together. PS – Want to turn this lunch salad into dinner? Why not stuff a roasted acorn squash with it? 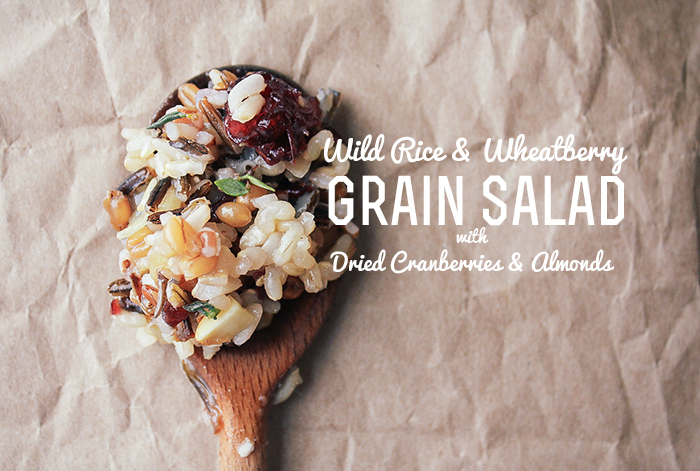 This sounds delicious, I love packing grain salads for lunch as they always last well. your photos are gorgeous, too. Yummy it looks delicious. I will have to make a trip to the grocery store, I must must give this a try. I am so excited to try this recipe! Thank so much for posting it. I love wheatberries, too and you summed up how wonderful they are. Yay! What is the serving size on this recipe? Can’t wait to try!